RUTGERS, New Jersey, February 26, 2016 (ENS) – Global sea level rose faster in the 20th century than in any of the 27 previous centuries, finds new research led by Rutgers University. Without global warming, global sea level would have risen by less than half the observed 20th century increase and might even have fallen, the scientists say. Instead, global sea level rose by about 14 centimeters, or 5.5 inches, from 1900 to 2000, putting vulnerable, low-lying coastal areas at risk. The Kopp-led study projects a global sea level rise of 1.7 to 4.3 feet in the 21st century if the world continues to rely heavily upon fossil fuels. Phasing out fossil fuels will reduce the very likely rise to between 0.8 and 2.0 feet. The study, published in “Proceedings of the National Academy of Sciences,” used a new statistical approach developed over the last two and a half years by Kopp, his postdoctoral associates Carling Hay and Eric Morrow, and Jerry Mitrovica, a professor at Harvard University. The study found that global sea level declined by about eight centimeters (three inches) between the years 1000 and 1400, a period when the planet cooled by about 0.2 degrees Celsius (0.4 degrees Fahrenheit). 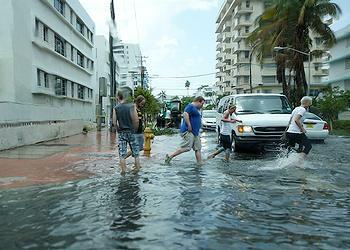 “It is striking that we see this sea-level change associated with this slight global cooling,” Kopp said. By comparison, global average temperature today is about one degree Celsius [1.8 degrees Fahrenheit] higher than it was in the late 19th century. For this study, a team led by Andrew Kemp, an assistant professor of earth and ocean sciences at Tufts University, and Benjamin Horton, a professor in Rutgers’ Department of Marine and Coastal Sciences, compiled a new database of geological sea-level indicators from marshes, coral atolls and archaeological sites that spanned the last 3,000 years. The database includes records from 24 locations around the world. Many of the records came from the field work of Kemp, Horton, or team members Roland Gehrels of the University of York in the United Kingdom and Jeffrey Donnelly of the Woods Hole Oceanographic Institution in Massachusetts. The analysis also tapped 66 tide-gauge records from the last 300 years. “Gathering together and standardizing these reconstructions gave us a chance to look at what they had in common and where they differed, both of which can tell us about the causes of past, present and future sea-level change,” said Kemp. Kopp’s collaborators Klaus Bittermann and Stefan Rahmstorf at Germany’s Potsdam Institute for Climate Impact Research used the study’s global sea-level reconstruction to calculate how temperatures relate to the rate of sea-level change. Based on this relationship, the study found that, without global warming, 20th century global sea-level change would very likely have been between a decrease of three centimeters (1.2 inches) and a rise of seven centimeters (2.8 inches). A companion report finds that, without the global warming-induced component of sea-level rise, more than half of the 8,000 coastal nuisance floods observed at studied U.S. tide gauge sites since 1950 would not have occurred. The Climate Central report, led by Benjamin Strauss and co-authored by Kopp, Bittermann, and William Sweet of NOAA, was published simultaneously with the sea level rise study on February 22. The research was funded by the National Science Foundation, the National Oceanic and Atmospheric Administration, the New Jersey Sea Grant Consortium, the Strategic Environmental Research and Development Group, the U.K. National Environmental Research Council, the Royal Society, and Harvard University.